Whole Wheat and Barley Ranger Cookies are Ranger Cookies are made with a combination of barley flour and whole wheat pastry flour. The mix of flours adds a bit of nutrition and gives the cookies just hint of wheat flavor plus a texture that’s kind of crispy on the outside and chewy in the middle. I linked to the Bob’s brand of barley flour, but any brand will do or if you have a Nutrimill, you can just grind up some barley. Barley has kind of a sweet, malt-y flavor to it, which is one of the reasons I go out of my way to buy it. It’s just a fun flour to play with. The brand of pastry flour I’ve been using lately is Hodgson Mill, and it seems to be heavier than some other whole wheat pastry flours. A 3/4 cup measure weighs 3.5 oz, whereas some brands of pastry flour weigh only 3 oz per 3/4 cup. If you’re using a different brand, just make sure to weigh out 3.5 oz and you should be fine. 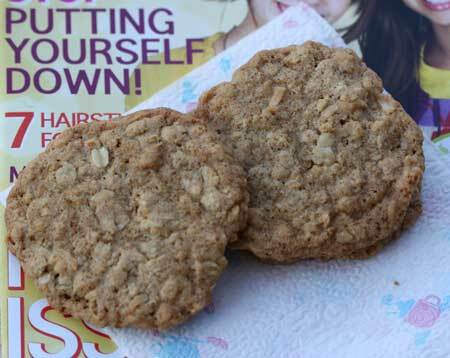 Whole Wheat Barley Ranger cookies made better with a little barley flour and whole wheat flour. Preheat oven to 350ºF. Have ready two ungreased baking sheets. Mix the whole wheat pastry flour, barley flour, baking powder, baking soda and salt together in a medium size bowl. In a mixing bowl using an electric mixer, beat the cool butter until it is creamy. Add the sugar and beat until creamy. Add the vanilla, then add the egg and beat just until it is blended in. By hand or using lowest speed of the mixer, add the flour and stir until blended. Add the oats, coconut and Rice Krispies and stir until blended. Using a heaping tablespoon (which is actually about 2 level tablespoons and weighed a little over an ounce), scoop up the dough and shape into balls. Press the balls slightly to make circles and arrange about 2 ½ inches apart on the ungreased baking sheets. Alternatively, you can just shape the dough, flatten it into circles, then chill until ready to use or freeze and bake as needed. 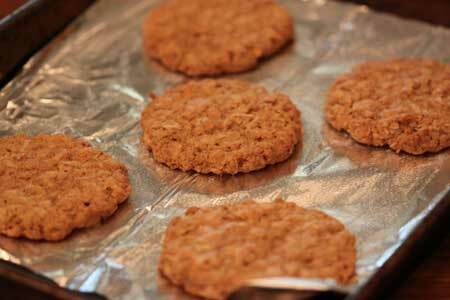 Bake the cookies one sheet at a time for 13-15 minutes (watch closely after 12 minutes). Let cool on baking sheet for about 2 minutes, then transfer to a wire rack to cool completely. Those look good. I’ve been wanting oatmeal cookies lately. About to make some for a friend and ship them to her. I’m not sure I have some barley, but it’d be fun to try grinding in my wheat grinder. Oddly enough I have most of the ingredients- but no barley flour and still on the lookout for the coconut. I like a crispy cookie so these would fit the bill. I have never heard of Ranger cookies! There is so much I need to learn! I was just at my local grocery store looking for unsweetened flaked coconut and could not find it. I was surprised. Is that what you use for this recipe? Are you going on a trip this week? I’m looking forward to a trip report! Hooray for barley flour! I’ve used it a few times because of recipes from Good to the Grain. I need to move on to ranger cookies now after baking all those cowboy cookies. I don’t usually have whole wheat pastry flour, barley flour, coconut, or krispy rice cereal on hand, but these seem worth gathering the ingredients. Thanks!